I never collected rocks when I was young. I really never once thought about gems until one day in the summer of 1979 on the campus of Amherst Massachusetts. I was one of 3,600 people participating in a 40 day long meditation retreat. After meditating daily for six hours a day I was in a rarified mental, emotional and spiritual state when a friend mentioned rubies and my entire life changed directions. I had been searching for a career, something to do with my life, something that was different, and something I would love to do; that’s all I knew. But until that moment, I did not have a clue what it was. Steve said, “See that guy over there, he imports rubies from Thailand”. Suddenly, it was like a lightning bolt of light inside! I knew instantly, with absolute certainty, this was what I would do with my life. That’s what I had been searching for. 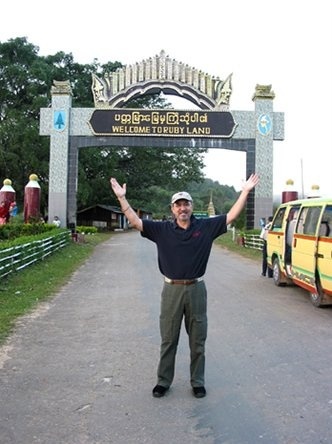 At the entrance to the famous Mogok Valley in upper Burma; Ruby Land. towards that goal of working with and understanding gemstones. Previous Post What Differentiates Us From Our Competition?